Why won’t Auction Watch #114 punch you in your stupid face? A few weekends ago while driving around North of Chicago I came across this guy squished in the ground & took a quick photo & posted on instagram. My friends were excited as I was to see this guy sticking it out, how long had he been there? I know the last time I held one of these was was almost fourteen years ago. 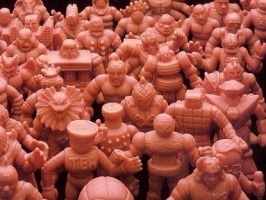 You may remember this series called M.U.S.C.L.E. Men from the 80′s that left more than a mark on our childhood hearts, a series of little plastic figurines we played with. When I saw the response I wanted to do something with the enthusiasm. I decided to make 24 prints to raise money & raise awareness for the month of October for Anti Bullying non profits. This print is titled “Outlast’em” in honor of a little guy sticking around for so long & never giving up (even when face down!). 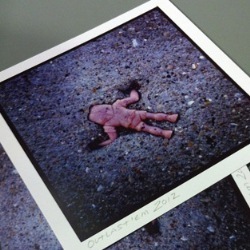 The print may not be an auction, but it certainly deserves attention – and not just from M.U.S.C.L.E. collectors. The prints can be order directly through Sarateatime.com With 60% going towards Anti-Bullying Non-Profits there is no reason to miss out on these limited edition prints! 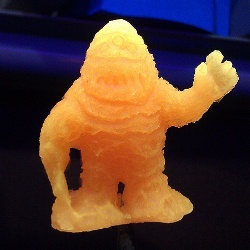 The first auction, Rare M.U.S.C.L.E scale Sand Terror 2″ Mini Fig Day Glow Sealed By The SandBagger, isn’t even a M.U.S.C.L.E. item – but will likely be very attractive to M.U.S.C.L.E. collectors. This seller had previously sold his Sandbagger figure (use this link when the eBay link has died) which was a featured auction in and old Epilogue. The Sandbagger was the first time keyword spamming was a positive thing. 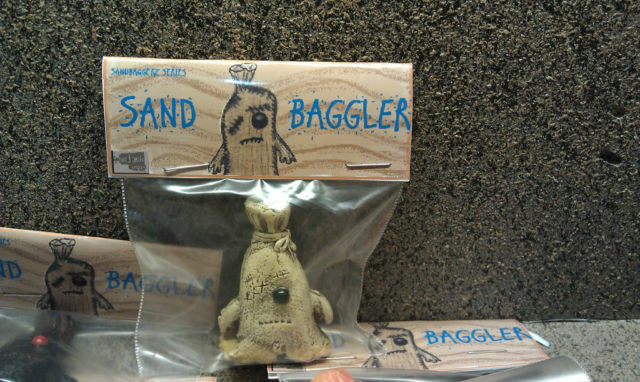 Keeping with the sand theme the seller has returned with the Sand Terror. If the starting bid of $14.99 was only slightly lower it may encourage more bidding. With its current opening bid it seems likely that the winning bid will be first bid. The final price of the first auction will be $14.99. Time is running out on the second auction – it ends today! But like the previous items featured in Auction Watch #114 this auction deserves some extra special attention. The second auction, 1985 Mattel M.U.S.C.L.E. Men– Mail away Poster 35″ x 23″ W/ORG SHIPPING TUBE, will probably attract bidders because the poster appears to be in good condition. However, the real gem of this auction is the original poster tube – a fascinating piece of M.U.S.C.L.E. ephemera. The M.U.S.C.L.E. 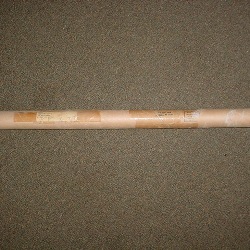 poster tubes may not be the most physically attractive piece, but it is certainly a super unique collectible. The first discovery of a poster tube actually helped gain greater insight into the 28-pack Poster Offer. The final price of the second auction will be $66.50. This entry was posted on Thursday, October 4th, 2012 and is filed under Auction Watch, UofM News. You can follow any responses to this entry through RSS 2.0. You can skip to the end and leave a response. Pinging is currently not allowed.